Pinot Grigio makes for a tasty white sangria. Photo by Ines Hegedus-Garcia. PINOT Grigio and Pinot Gris are strongly related to their namesake, Pinot Noir. Some describe them as a genetic mutation, making them, in lay terms, Pinot Noir’s cousin. Instead of the Noir’s lush, dark, pine-cone shaped clusters bearing red wine, imagine grapes printed in grayscale – slightly washed out with an almost ashen hue. That's Pinot Gris and Pinot Grigio. From such gray-reddish grapes comes a white wine. Surprising? Well, that’s just the beginning. And to make the point, let’s take a short detour through cable TV’s Nick@Nite. 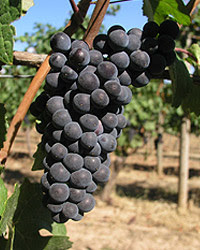 A cluster of the dark, pine-coned shaped Pinot Noir grape. Photo from WikiCommons. Different as night and day." When cousins are two of akind. 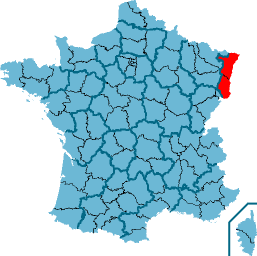 The area shaded in red on the map of France is the Alsatian region. It produces some of country's finest white wines. Photo from WikiCommons. Think of inexpensive Pinot Grigios as the Budweiser of wines: light, relatively non-descript, and accordingly, an unassuming inoffensive wine. Want to quaff something without thinking, perhaps serve something that everyone will like and no one will remember? Cheap Pinot Grigio is the way to go. Barely colored and with barely a hint of a scent of flowers (light nose, sometimes floral), inexpensive Pinot Grigios have none of that sharp bite (low tannins) and tend toward mellow fruit flavors (hint of melon, sometimes citrus). Sounds too generic or bland? 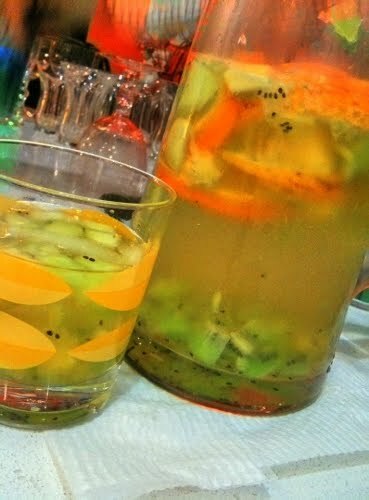 Kick it up a notch by making a white sangria: Soak a peeled and diced orange, apple, and lemon in a cup of gin for an hour. Add ¼ cup of sugar. Stir in a bottle of Pinot Grigio. Chill and serve. Feeling daring? Add kiwi or cantaloupe right before pouring. Party genius in no time at all. But please don’t let that pedantic run-of-the-mill $9 wine speak for the rest. Higher end Pinot Grigios, including those produced in Oregon and Washington, are full of flavor and usually slightly deeper in color. Imagine a wine approaching the intensity of a Sauvignon Blanc, but kinder, gentler, softer. That’s the potential of a Pinot Grigio. And that’s still the lavender side of the purple scale. Vezzo is a very inexpensive and appealing Pinot Grigio. Photo courtesy of Astor Wines. If Pinot Grigio is lavender, then Pinot Gris (and Tocai d’Alsace and Graubugunder) is pure royal purple. Move over, Patty! Cathy has just entered the room, ready for her minuet, Ballet Russe and crepes Suzette. Made not in the light Italianate style (and not with overproduced grapes), the wines from French, Alsatian and German producers tend toward more concentrated flavors. The color of the wines typically deepen, with a richer, fuller taste (well-rounded, sometimes even creamy/butter/almost oily). Wines of the best quality match well almost any food, including red meat, breaking the rule – red wines with red meats, white wines with white or pink meats. Throw those distinctions out the door. Savor hearty Pinot Gris with hearty meals. Disregard what I said about cheap Pinot Grigios being the Budweiser of wine. This one is the exception. Buy a case and have lots of friends over. Best buy of the summer. Label of the King Estate Pinot Gris 2009. The wine pairs well with swordfish and spicy dishes. 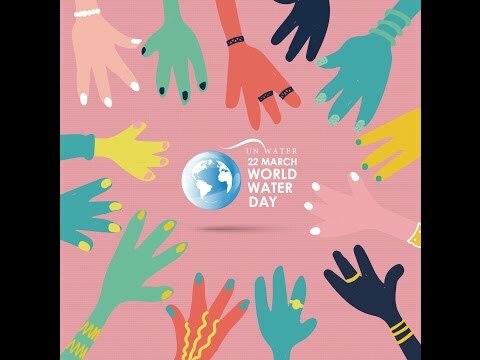 Photo courtesy of King Estate. Regard what I said about inexpensive Pinot Grigios. Still, an unassuming inoffensive wine – what’s not to like? Makes great white sangria. Ahh!, the Oregonian Pinot Gris. Taste the fullness as the citrus rolls in over the tongue. Excellent with swordfish and perfect for balancing out spicy dishes. Trimbach Reserve Pinot Gris 2004 has a reputation for being universally appealing. Photo courtesy of Trimbach. A steal at $20. 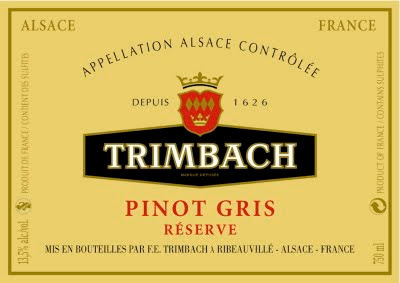 Producing quality wines since 1626, Trimbach’s Pinot Gris Reserve will impress the most jaded wine drinker. Perfect with any seafood, especially smoked salmon. Elegance in a bottle. While most white wines do not store well, this one will age for a few more years beautifully. Rich in flavor as well as rich in subtleties, Schimberg is a conversation piece in and of itself. Added bonus: Biodynamic wine. Enjoy!